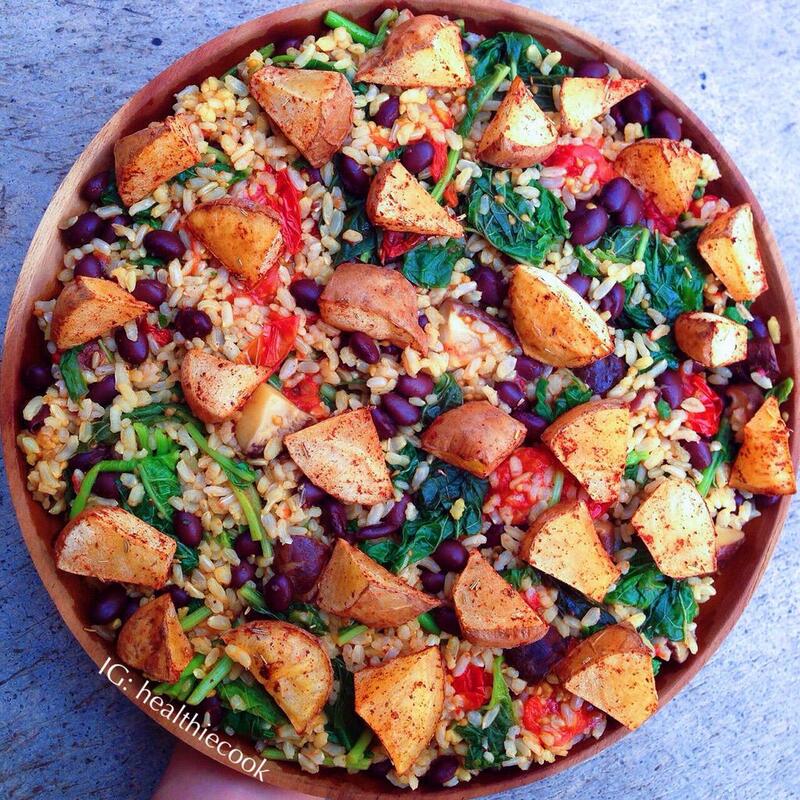 Potatoes + Rice may seem like a weird combo, but I think they taste really nice together! Plus both of them are the most common ingredient in any vegan's kitchen (you should have em in your kitchen too!!). Cheap, delicious, and good for you, why not? Arrange the halved cherry tomatoes on a parchment-lined baking sheet. Put the garlic cloves (peeled) on top. Arrange the potato chunks on a separate baking sheet. Roast both in a preheated 200 Celcius oven for about 20 minutes. Mash the roasted garlic in a small bowl, add in the curry powder, coconut milk & soy sauce to make a nice paste. Put the cooked rice, vegetables, beans, roasted tomatoes into a big pan, stir everything together until combined. Turn on the heat (medium-high), pour the curry spice mix into the frying pan, stir fry until everything is heated through, coated with the seasoning. Season with salt & pepper to taste (optional). 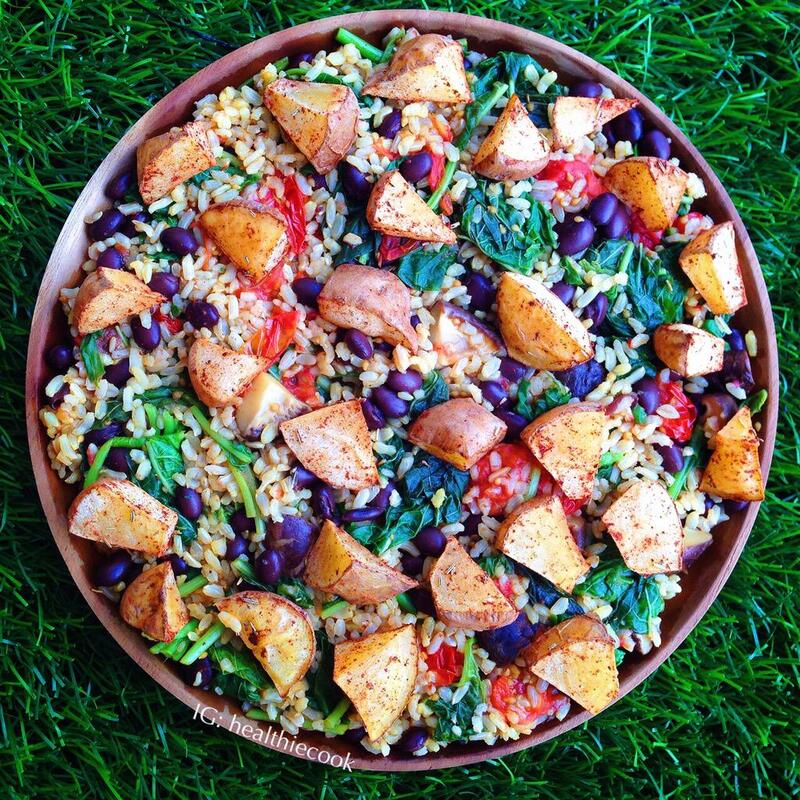 Pour into a big bowl/plate, top with the roasted potato chunks, Enjoy!!! Hello Chelsea :-) I'm a 45 year old mum to two daughters age 16 and 19, and we all love to cook/eat recipes from all over the world. Anyway - I stumbled across your blog as I googled 'healthy coconut milk recipes' and your page came up. Is using thick coconut milk a necessity or is normal coconut milk okay? Aaah thank you so much! I really appreciate it! :) Enjoy!! I'm a 15 yo girl who loves to cook & eat! Here you can find my own plant based, delicious, and healthy recipes! Enjoy!